Raw pasta topped with avocado pesto sauce, completely raw and unprocessed recipe. Blend all the ingredients together but will better to roast the Pine nuts before add it for extra flavor. 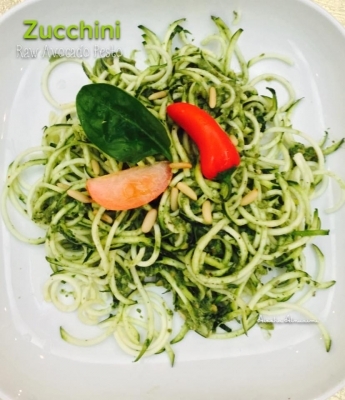 Mix the sauce with the raw zucchini pasta.. (I make this pasta using a #spirooli.